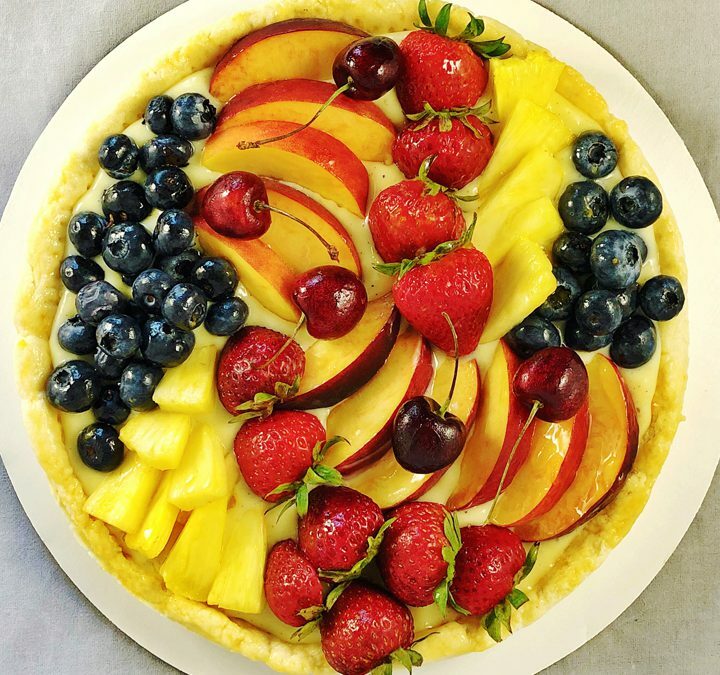 A summer fruit tart recipe is the best way to use the season’s ripest yield. Topped with a combination of fruits to bring out summer’s sweetness, we like our shortbread crust filled to the brim with Grand Marnier and Vanilla Bean Pastry Cream. To make the shortbread crust: In a small bowl, whisk the flour with the salt. Place the butter in a mixer bowl, add the sugar, and beat until light and fluffy. Lightly whisk the egg then add to the butter mixture, beating until just incorporated. Add the flour mixture all at once and mix just until the dough forms into a ball. Dump out on a floured surface and flatten into a disk, wrap in plastic wrap, or place in a zip-top bag. Refrigerate for at least 30 minutes or just until firm. Lightly butter an 8” or 9” tart pan with a removable bottom or an 8” or 9” tart ring. Roll the dough into an 8” or 9” circle then add to the pan or ring and evenly pat the dough onto the bottom and up the sides of the container or pastry ring. Cover with plastic wrap and rest in the refrigerator for a least one hour. When ready to bake, preheat the oven to 400˚F. Lightly prick bottom and sides of the pastry crust with the tines of a fork and place the tart pan on a baking sheet. Bake the crust for 5 minutes then reduce the oven temperature to 350˚F and continue baking the crust for about 15 minutes more or until dry and lightly golden brown. Remove from oven and place on a wire rack to cool completely. To make the pastry cream: In a medium-sized bowl, whisk the sugar and egg yolks together. Sift the flour and cornstarch together into the egg mixture and mix into a smooth paste. In a saucepan, add the milk and heat until the liquid starts to foam up. Remove from heat and slowly temper small amounts at a time into the egg mixture, constantly whisking to keep a smooth mixture. Pour the egg mixture into a clean medium saucepan and cook over medium heat until just boiling, whisking constantly. When it boils, remove from heat and immediately whisk in the vanilla bean paste and Grand Marnier. Pour into a clean bowl and quickly cover the surface with plastic wrap to prevent a layer from forming. Cool to room temperature and then refrigerate until very cold. When ready to use, whisk to remove any lumps that may have formed. Topping: Heat the apricot jam with one tablespoon of water in a small saucepan over medium heat until liquid. Remove from heat and strain the jam through a fine strainer to remove any fruit lumps. To Assemble Tart: Be sure to assemble the tart on the day it will be eaten. Remove the tart from the sides of the pan and remove the bottom of the pan, then slide the tart shell on to a platter. Spread a thin layer of apricot glaze over the bottom and up the sides of the baked tart shell to help prevent the crust from getting soggy. Let the glaze dry for 20 minutes. Spread the pastry cream onto the bottom of the tart shell over the glaze. Arrange the fruit on top and carefully brush a very light coating of fruit glaze on the fruit. Refrigerate until ready, serves 6.